I just got today Dec. 30, 2017, from Phd. 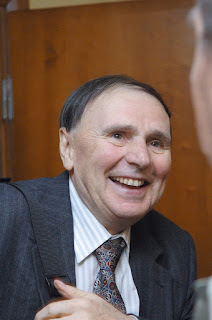 Marcis Gasuns, an obituary to Late Andrey Zaliznyak, Sanskrit Scholar par excellence. Do we in India know that Sanskrit is being studied in Russia, so passionately and so scholarly ? Certainly it is a great loss for the World of Sanskrit ! May the soul rest in peace ! for more than 50 years from time to time, mixing it with Old Persian, Arabic and Old Church Slavonic) whom I can compare to Panini, it is he. He learned Sanskrit from Renou in Paris. His article on classification of verbal roots (1975) is still outstanding and there is nothing of that kind written in French, German or English – before or after. It takes Whitney and reclassifies his Sanskrit Roots in a logical way, adding meta-data, but typographically, instead of Panini’s letter-anubandhas. but goes beyond and adds classification in which exclusions become part of the rule, something I’ve not seen for last 2500 years in India. In 2015 I printed his “A Brief Outline of Sanskrit Grammar”, that was circulating widely since 2004 as a 10-page handout. To understand it one needs to have brain an patience, a rare combination nowadays. Zaliznyak is mostly known as the man who reopened the Russian language, reading for the first time the 1000 years old birch bark letters. But for me, he remains to be my teacher of Sanskrit and it’s a pity that the level reached in research of Sanskrit has not gone outside Russia. I’ve read tens and hundreds of manuals, textbooks and readers on Sanskrit. But only Panini is above Zaliznyak. But I never visited Pakistan, so we did not met before. On the West only George Cardona comes close. A month before his best colleague, Ivanov died. Ivanov’s book “Sanskrit. Moscow: Nauka Pub. House, Central Dept. of Oriental Literature, 1968” was lately still quoted by Peter Scharf, Cardona’s most talented pupil. So in just 2 months, we have lost 2 of the most outstanding Russian Sanskrit scholars. From the old school, only Vera Kochergina (in her 93 years) remains the last keeper of fire in Moscow (and Russia). We’ve become deserted. Then came the undergraduate courses. The first one was Sanskrit. We get a handout. Seven pages. Half a page for the writing system. The rest of it was *all* of the grammar, and a list of roots. What are we meant to do? ‘Here is a stanza from the Mahabharata. Go.’ And we did. Oh boy we did. It was magic, again, but now week in and week out. Did I become a Sanskritologist? Of course I didn’t. Was I able to construct, in a few hours, a data set for my phonology exam this year, more than ten years later, still using that handout? Yes I was. Please let me know if there is a printed journal on Sanskrit where I could print my Obituary. I did not do it for Elizarenkova. So give me a chance to do it for Zaliznyak, if you can. This entry was posted in News from Sanskrit-world, Uncategorized. Bookmark the permalink.